Sadly, coleslaw has a bad reputation. Because it’s often soggy and tastes of nothing more than cheap commercial mayonnaise it is considered as the most pedestrian of salad choices. In reality coleslaw can be deliciously crisp and vibrant with a sweet acidic tang. Commercial coleslaw is soggy because the cabbage and carrot are shredded on a machine that rips, tears and bruises, causing them to bleed their juices when the dressing is added, emphasizing the osmotic affect. So the first rule of thumb for making excellent crisp coleslaw is to hand cut the cabbage, carrot and apple. 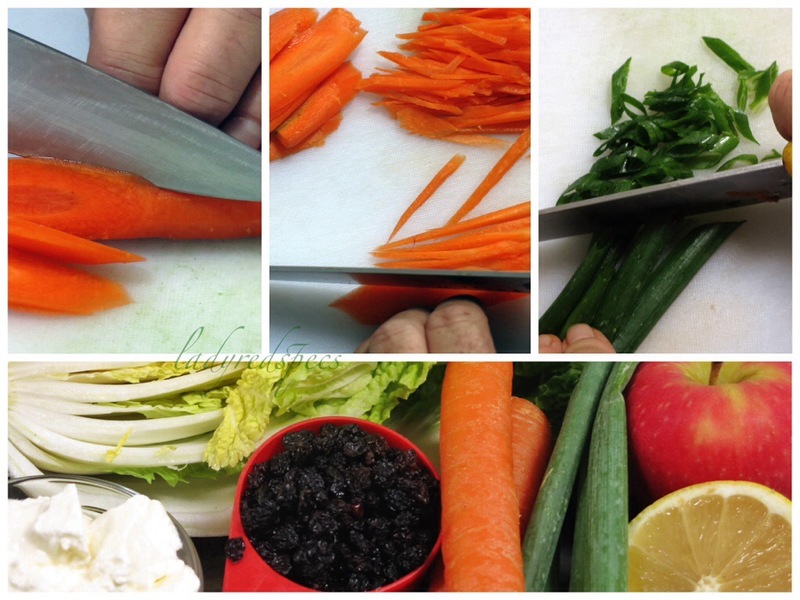 It takes a few minutes longer, but there is no waste, little mess and cutting your vegie julienne by hand with a sharp cook’s knife is a great way to develop your knife skills. My Mum always added apple to her coleslaw. The sweet acidity is perfect with the raw soft leaf cabbage, it’s the flavour I expect from coleslaw, so I add apple too. It’s important though to toss the apple in lemon juice so that the cut surfaces maintain their fresh colour, the lemon then underscores the fresh flavour of the salad, while the currants add an element of sweet surprise. Use clean hands to massage the yoghurt through the coleslaw. It’s the only way to do a thorough job. The gentle acidity of coleslaw makes it an excellent aside to crumbed fried food, like fish or schnitzel. Wash and dry the apple, but do not peel. 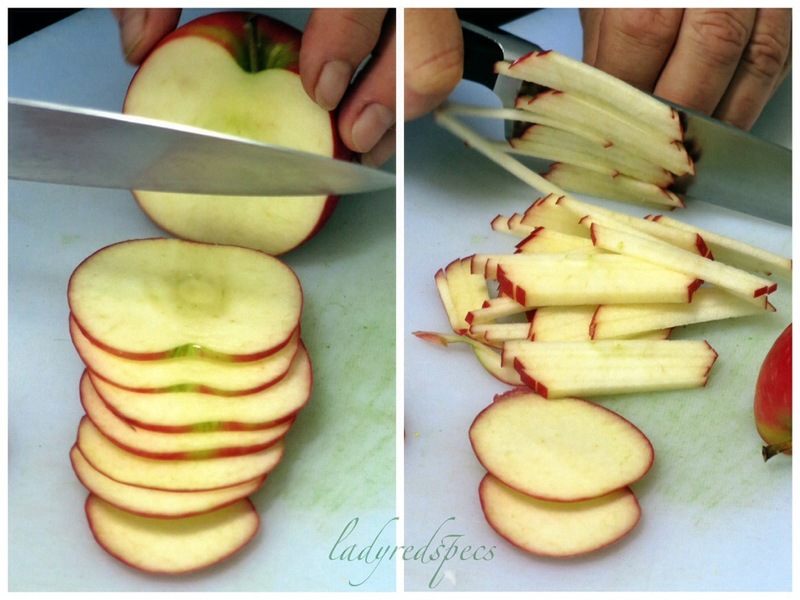 Cut thin rounds off the apple, then stack the rounds and slice the apple into thin julienne. Put the apple into a small bowl, sprinkle the lemon juice over, then toss to coat. Set aside. Separate the cabbage leaves, wash and dry thoroughly. Slit the wide thick stem section vertically. Roll several leaves together into a cigar shape and using a cook’s knife shred finely. 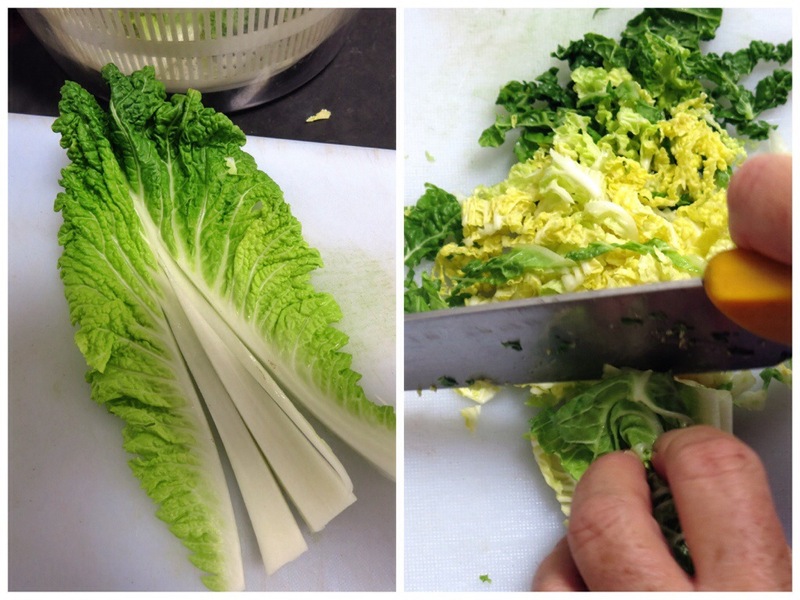 Continue making cigar rolls and cutting until the cabbage is all sliced. Place it into a large bowl and set aside. Peel the carrot, then cut long diagonal circles down its length. Stack the circles and cut into fine julienne. Add the carrot to the cabbage. Wash the spring onion greens and pat dry. Cut the spring onion into fine rounds then add the the cabbage along with the currants and lemony apple. Add the yoghurt, then using clean hands, massage it through the salad to thoroughly dress. This looks like the best coleslaw I have ever seen! We love coleslaw and make it year round. No two batches are alike! Love it with yogurt too. I’m going to try your recipe…love it! Thanks Seana, it’s quite a compliment to be able to inspire you!!! I love a freshly made coleslaw. I always order it at restaurants and am always disappointed at the soggy mess. This looks great. As other commenters suggested, I will probably play with the dressing, sometimes your suggested yogurt, sometimes mayonnaise, aioli or vinaigrette. The best way to learn about your palate and your preferences is to try different flavours, I’m all for it. A nine year old told me recently that our taste buds only last for 2 weeks and the new ones that grow might like different food to the old taste buds. Love that scrumptious first photo, and really interested in the idea of using yogurt. We’re huge coleslaw eaters in this house. I make it once a week or so and the idea of doing away with all that mayo is hugely appealing! Love your related/archived rice paper roll post. I have a paper roll post in the works as we speak! They’re also on high rotation in this house, often filled with leftovers but I’ve never thought to use coleslaw in them – brilliant idea! Thanks Saskia, you’ll be surprised how good coleslaw dressed with yoghurt tastes. The other big plus is it keeps without collapsing! Rice papers are brilliant for hiding leftovers, but mine always seems to start with some sort of coleslawish combo. I love the crunch! Coleslaw really does have a bad reputation! This coleslaw, however, looks delightfully fresh, crunchy and not too heavy on the dressing. My mouth is literally watering at the thought of the mix of sweetness with the apples and currants in with everything else. Yum! Coleslaw really does have a bad reputation! This coleslaw, however, looks delightfully fresh, crunchy and not too heavy on the dressing. My mouth is literally watering at the though of the mix of sweetness with the apples and currants in with everything else. Yum! Using yogurt instead of mayonnaise is the deal breaker in your coleslaw. I will give it a go and if I like it, I will throw my mayo in the bin. Thanks again for the handy tips! Beautiful arrangement of the coleslaw in the glass bowl, too! If you like yoghurt, I guarantee you’ll love it as coleslaw dressing! I’m sure you’ll like the fresh flavour of yoghurt with the coleslaw. I love of dollop of yoghurt on a jacket potato, but I’ve never dressed a potato salad with it, mmmm food for thought! I agree coleslaw can be really good or really bad depending on the ingredients and methods. A favourite is my mum’s cold potato slaw which she adds crispy bacon bits, best eaten with her awesome roast pork. You have to wonder who buys the soggy stuff at the supermarket! 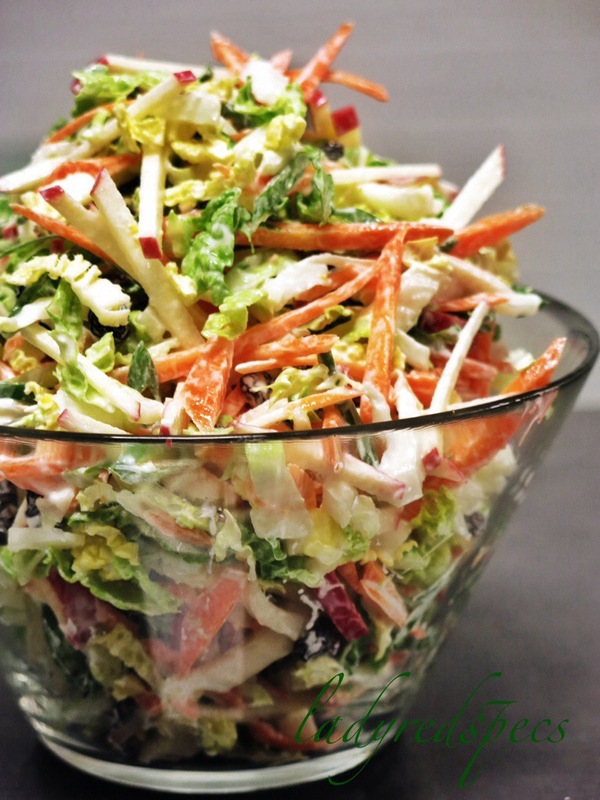 I often make coleslaw with a vinaigrette – your version of fruit and yogurt looks delicious. I think I will try this tonight. Hi Sandra. I too love a well made coleslaw. They are nothing like the soggy commercial ones. You get such a delicious salad for so little effort! I really love coleslaw, but have never tried it with Chinese cabbage (as the Brits call it) or Napa cabbage (as the Americans call it). I’m assuming it is the same thing as wombok? I usually use yoghurt as well – much lighter. Oo sorry, yes wombok is Chinese cabbage. The texture and flavour is perfect for coleslaw. I love your version of a ‘side’ which I absolutely love!! Crisp, tasty, colourful and appetizing!! Uhuh!! I have usually handcut ’cause it is simply too much bother to find the apparatus and later wash it 🙂 ! I am likely to try homemade yogurt on almost everything these days [well, there are differing kinds as far as taste is concerned 🙂 ! Have not used currants in the mix – next ‘thing’ to try!! Thanks!!!! We eat gallons of yoghurt, I gave up making it though, one batch blew up!! It makes a great coleslaw dressing! Do try currants in your next batch of coleslaw they add a lovely sweet surprise. I’m interested to see that you use yogurt, but can imagine it gives a much cleaner taste. Though I imagine home made mayonnaise would also be pretty good? While we have a shredding attachment on the stand mixer I’ve never used it (! ), cooking for two it always seems easier to shred/julienne vegetables by hand. Sometimes machinery is not the answer! It really does mangle vegies and by the time you set up and clean up, it’s not worth the effort! This entry was posted on February 22, 2014 by ladyredspecs in Food, Gluten Free, Light Savoury Dishes, Side Dishes & Salads and tagged Coleslaw, FODMAP friendly, gluten free, salads, tutorial, vegetarian.